Downloading our backgammon software is very easy. 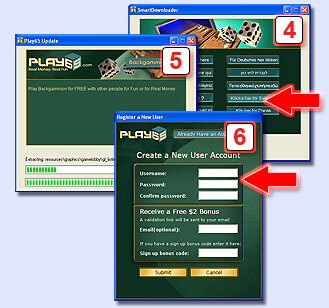 Follow these steps and you will play online backgammon with other players around the world in no time! Click here to start downloading the our backgammon software. Click the Run (or Open) button. 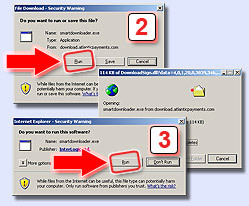 After the download is complete, click the Run (or Open) button again. Choose the language, in which you wish to install the software. The installing window will appear. Please wait until the backgammon software installation process is complete. Enter your valid e-mail address and get $2 for free*! *In order to prevent bonus abuse, our $2 sign-up bonus can be received only once per person, computer or household. You can get up to 20$ of bonuses! Read more at our Play65 bonus code page.